Dr Sushma Arya has held several major administrative positions including Regional Director, DAV Public Schools, DAV CMC, New Delhi and incharge of the upcoming DAV University for Women at Yamuna Nagar in Haryana before joining the University. 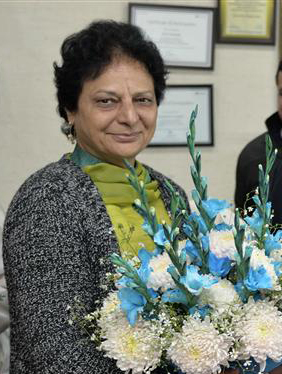 A Ph.D in English Literature, she also served as Principal at DAV College for Girls, Yamuna Nagar and Associate Professor in the Department of English, Kurukshetra University during the stint of her 39-year academic career. During her tenure as Principal, National Assessment and Accreditation Committee (NAAC) had granted A Grade to DAV College for Girls, Yamuna Nagar and the institution was selected as the college with potential for excellence by University Grants Commission, New Delhi. The college led by her was also declared as Best Women College of Kurukshetra University in 2003-04 while it got the Best Women College Award in 2017.